Are you a homeowner in Burnet TX with a large home improvement project or house clean-up project? Maybe you are a contractor with an upcoming roofing job or some other home improvement project, then you will need a dumpster rental to keep your work area clean and to dispose of any unwanted waste. 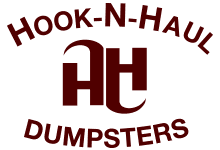 Hook N Haul dumpster rental is your top choice for a Burnet dumpster rental offering same day dumpster delivery at an affordable price. We have a large inventory of roll off dumpsters and a variety of sizes to handle any size project you have planned for your home or business. We offer both residential dumpster rentals and commercial dumpster rentals in Burnet TX. We are a top rated dumpster rental because we offer an unmatched level of customer service and always have the right size of roll off dumpster for your job or project. Just call us today at 512-876-0271 or fill out a quick form to secure your dumpster rental today. 10 yard dumpster rental Burnet TX – These dumpsters are great when you’re remodeling a room, tearing out a deck or cleaning up yard debris. Our dumpsters hold light and heavy materials, including concrete, soil and gravel. 12 yard dumpster rental Burnet TX - If the 10 yd dumpster just won't get it done for your home project or commercial job then we offer this size to give you a little more space to fit the waste. 20 yard dumpster rental Burnet TX – If you have plans to take on commercial remodeling, large renovations, roof removal or restoration work, this dumpster can accommodate as much as 4 tons of heavy debris, including roof shingles, soil and gravel. 30 yard dumpster rental Burnet TX – Our largest dumpster is built for commercial projects, large renovations, new construction, storm cleanup and project cleanups with bulky debris. This dumpster cannot handle heavy debris, such as soil, concrete or gravel. With the different choices of dumpster rental sizes sometimes it can leave our customers in Burnet, TX feeling overwhelmed as to which size of dumpster they need for the project or job they have. If you have questions about the size of dumpster rental you need the best decision is to always choose a size up to ensure you don’t load the dumpster past the weight capacity or just call Hook N Haul dumpsters to ask us what size we recommend based on the type of job and amount of waste you have.